I’ve been known to do geeky things. 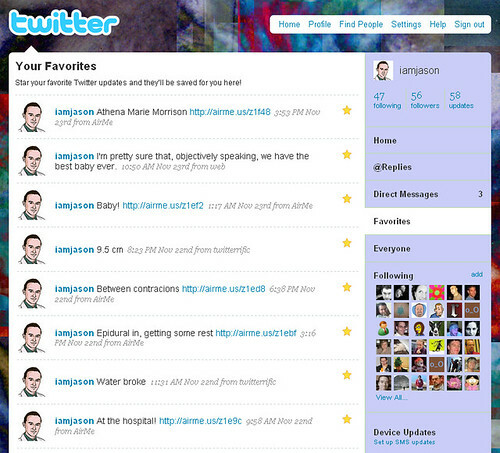 For one, I’ve been experimenting with putting parts of my life on the web live via Twitter. For another, I’ve been going to a 30-hour science fiction movie marathon with friends for the past 14 years. It’s time to merge the two together in a Twitter Experiment this weekend. Starting on Friday, 7 p.m. EST I’ll be posting updates to Twitter about the movies, ridiculous sci-fi plot devices, funny cracks from the crowd, and the general movie marathon experience. Q: How can I follow along? A: Follow me on Twitter and watch the snippets roll in. Alternatively, if you’re connected to me on Facebook you can watch my status updates, it’s the same thing. Q: I’m going to be there, how can I participate? Let me know in the comments below, we’ll make it a thing. EDIT: Use hashtag #marathon34 in any Tweets. Q: Why would anyone have even the slightest interest in this? A: The CWRU Science Fiction Marathon is really an excuse for a bunch of sarcastic people to shout insults and rejoinders at a movie screen. It’s like a huge, live-action, sleep-deprived version of Mystery Science Theater 3000. Q: No, I mean why would anyone have the slightest interest in you going to a movie marathon? A: Point taken, its not like I’m famous or anything (outside of being temporarily internet famous in Australia, of course). Luckily many of my readers are friends, colleagues, and a bit geeky themselves. If you’re going to get a tiny-text-snippet tour through a science fiction marathon, though, I might as well be your guide – I have a fair knowledge of the genre, I used to be a movie reviewer, and I like to make sarcastic comments. A: An iPhone, and WiFi or the regular data connection, that’s how. I might also play around with my G1 phone with Android a bit. If my connectivity fails for some reason, I reserve the right to basically give up and pretend I never even mentioned it. One other thing I just can’t leave out of this post – when I mentioned this to my coworkers, they poked fun. My coworkers at Google. That’s right, I’m officially too geeky for Google. When we were looking for hospitals and doctors offices for little Athena, wifi wasn’t really on the list so much as reputation, compatibility with our insurance, and other concerns. In retrospect, though, thank goodness Stanford Hospital and Palo Alto Medical Foundation have wifi. We live more than 2,000 miles from most of our family. Not all of them could make the flight to California for the birth. We also have too many friends around the country to possibly make all the phone calls we’d have liked to have made that night. In addition, we had several thousand people all over the world wondering which name we would pick for our baby. I’m not sure I can properly express here how much it meant to her and the rest of our family to be able to see Athena so quickly. 2) Using the Twitterific App on my iPhone was was able to post updates to Twitter throughout the whole labor. This is a perfect example of what Twitter is good for. Liveblogging while my wife endures the pains of childbirth would be ridiculously insensitive, but there were always minutes of downtime here and there to tap out a few words describing what’s going on. 3) Using the Twitter App for Facebook, my updates showed up on my Facebook status as well. This was a big help, since so many more friends and family use Facebook than Twitter. A fourth option, which we didn’t use but might have had the labor been longer, was videoconferencing with Skype. We’ve been using Skype to keep in touch with family for some time. It is currently my grandmother’s favorite thing to do. Since we’ve been back home Athena has become the star of many family video sessions. One final thing I have to mention is YouTube – we certainly weren’t going to share the gooey miracle of life with the world in streaming video, but my wife followed the videos fo several other women during pregancy up to and including labor. We don’t know a lot of other couples having kids right now, so that gave Ann a personal connection with their stories and helped her through some of the tougher times during the last 9 months. She could see that other people were going through the same things she was and that was an important comfort. The common theme here, which I think goes a long way toward explaining the growth of the internet as a whole, is communication. Because of almost universal connectivity, we were able to turn a deep personal experience into a social experience as well.